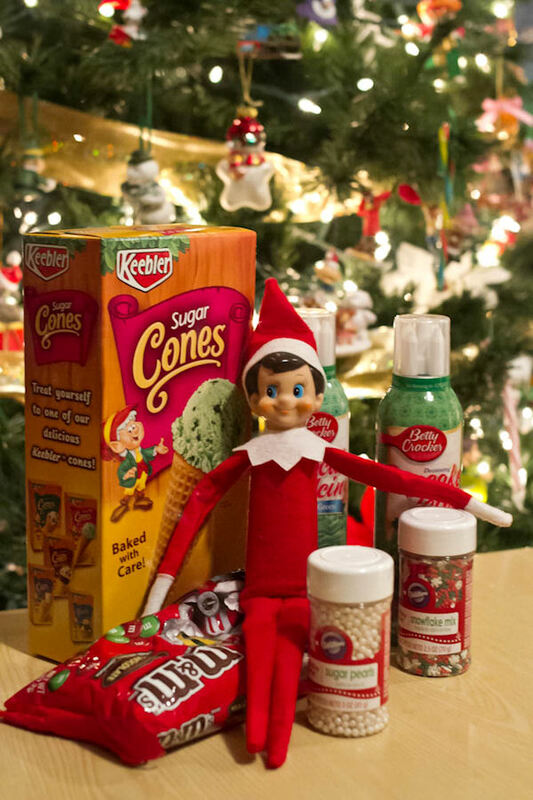 Nikki shares 24 days of Elf on the Shelf ideas. 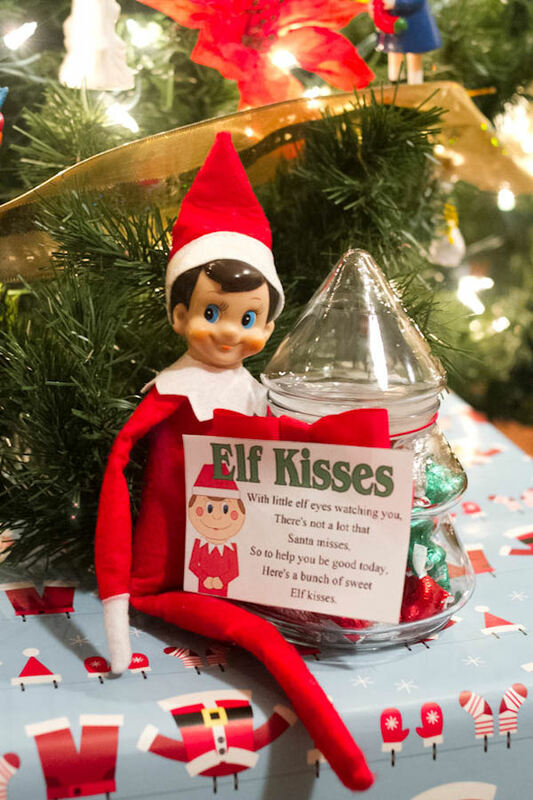 This year will be our family’s third year to welcome our little Elf, Buddy, on December 1st. I have so much fun coming up with ideas for Buddy every day before Christmas and I thought I’d share what he got up to around here last year for you here. 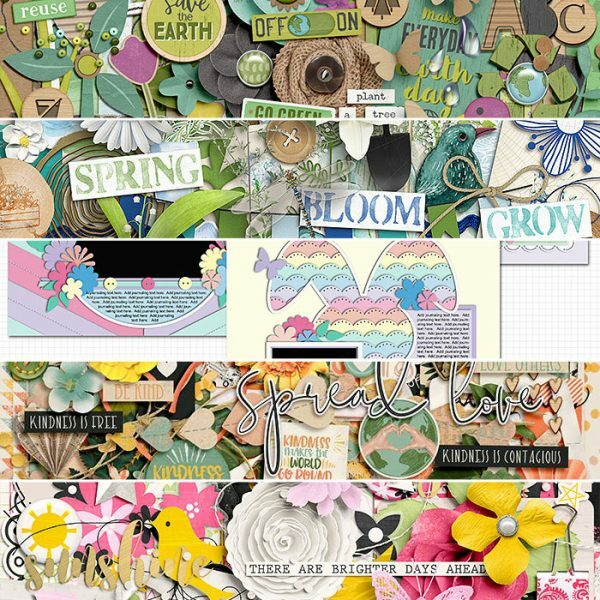 Some of these ideas are my own, and some I found on Pinterest. 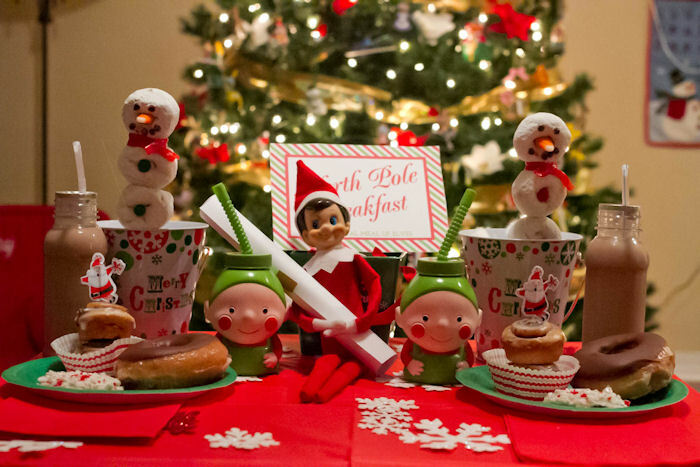 December 1 – Buddy showed up that morning with a “North Pole Breakfast” and a note from Santa. Yes I went way overboard with the sugary treats. My kids didn’t eat but a few bites of a doughnut I think but it sure looked cute! 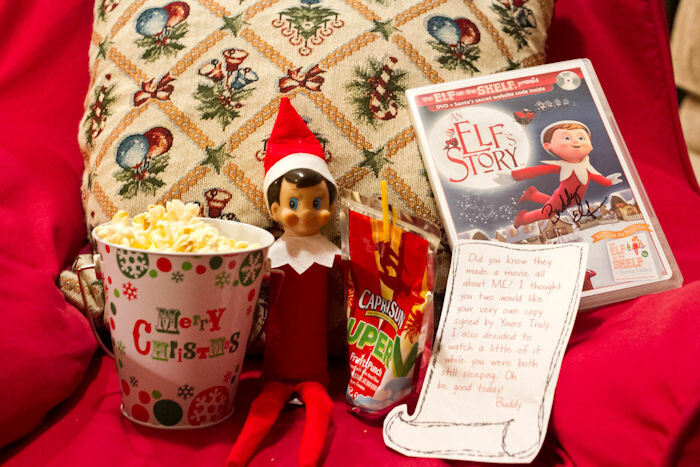 December 2 – The kids woke up to find Buddy watching his own movie, snacking on popcorn and juice. He even signed the DVD case for them. 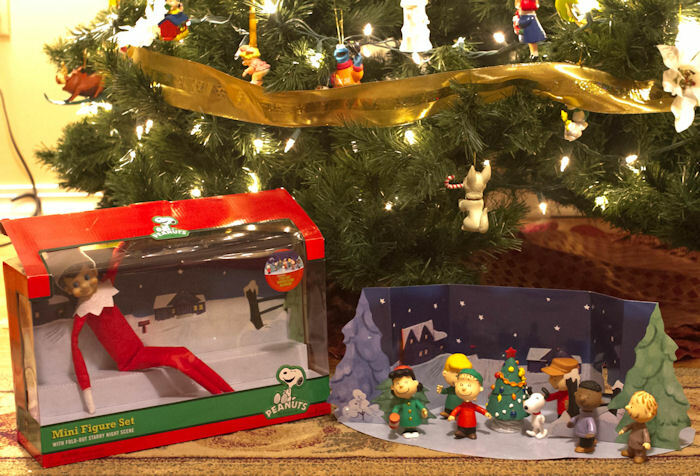 December 3 – My kids love A Charlie Brown Christmas so I picked up these little figurines for them and had Buddy trapped inside the box. 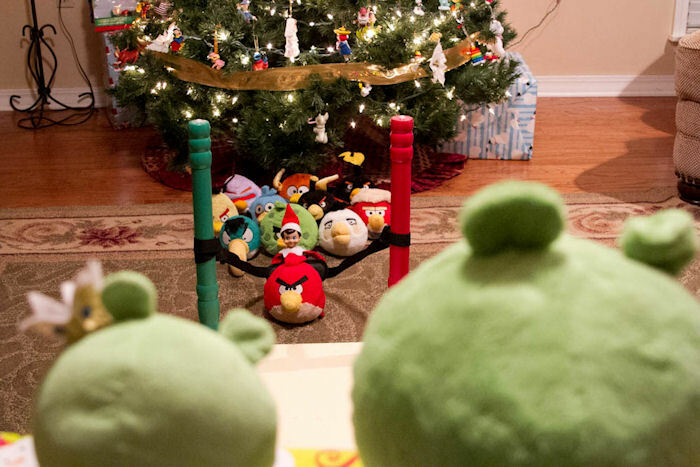 December 4 – We woke up to find Buddy playing with all the Angry Bird toys. My kids LOVED this one. They thought it was so funny that they were playing together. 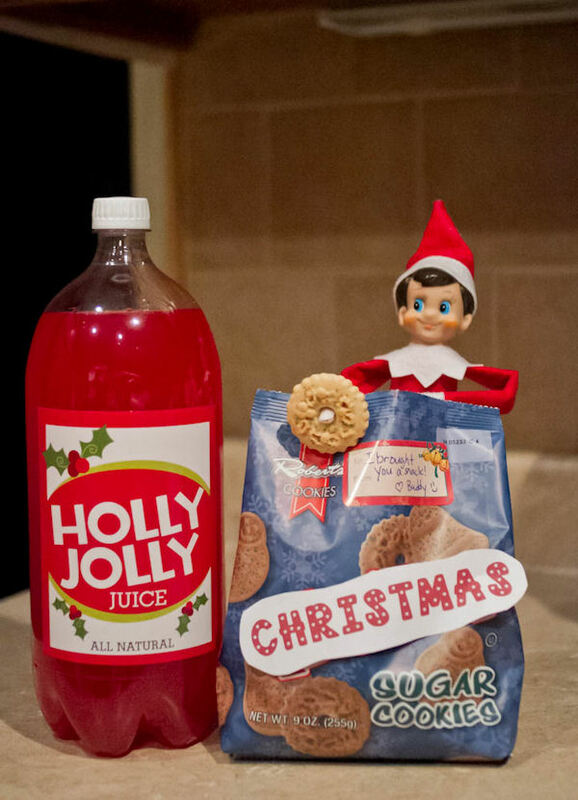 December 5 – Buddy brought Christmas Snacks – I found the cute stick on labels for the fruit punch at the Dollar Store. 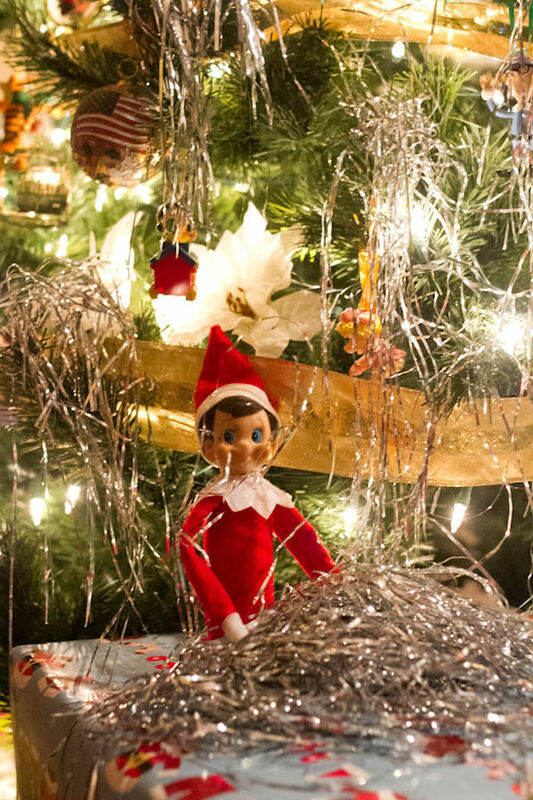 December 6 – Buddy tried to do a little decorating with tinsel. 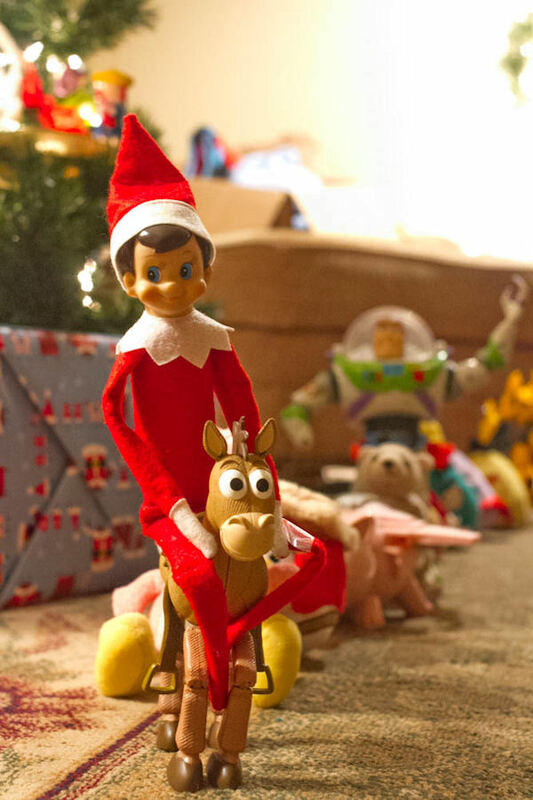 December 7 – We woke up to a toy parade with Buddy leading the way. 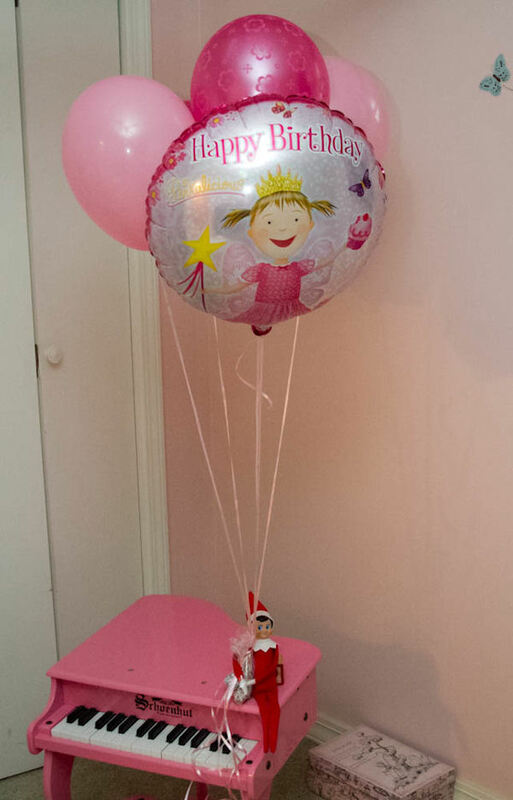 December 8 – My daughter Ella’s Birthday is December 10 and so the day of her party she woke up to find Buddy in her room with a bunch of balloons. 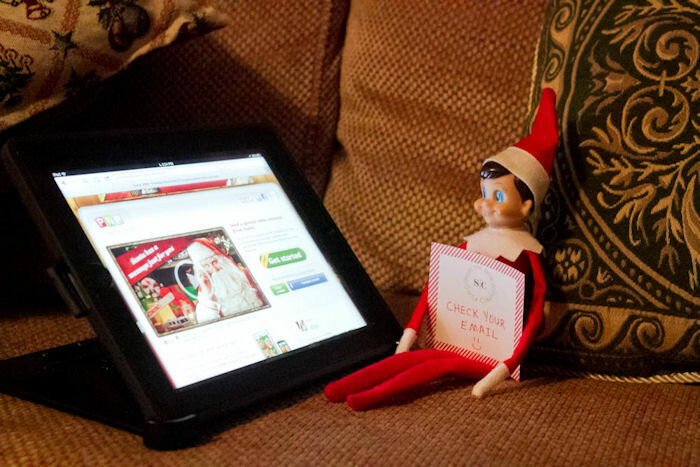 December 9 – Video letters from Santa on the iPad. 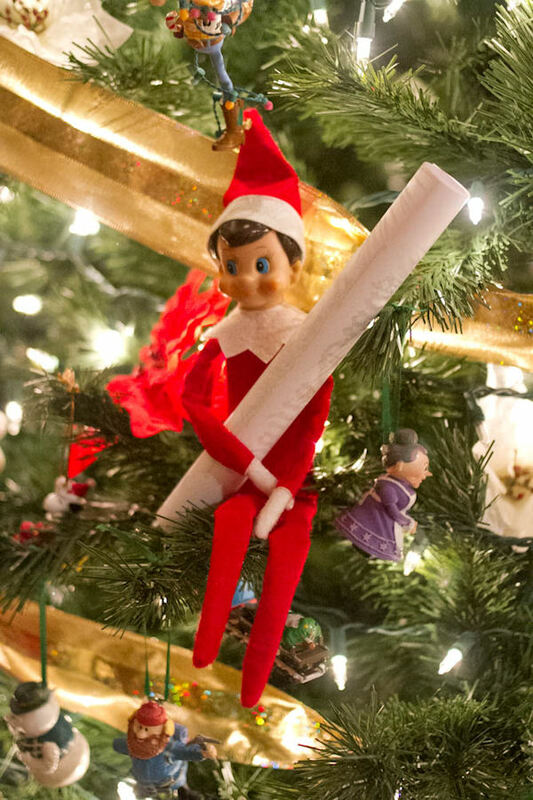 December 10 – This day Buddy had a note from Santa with a warning to behave since they’d had a bad day the day before. December 11 – I found this adorable Charlie Brown Tree at Hallmark so the kids found Buddy with it on this morning. 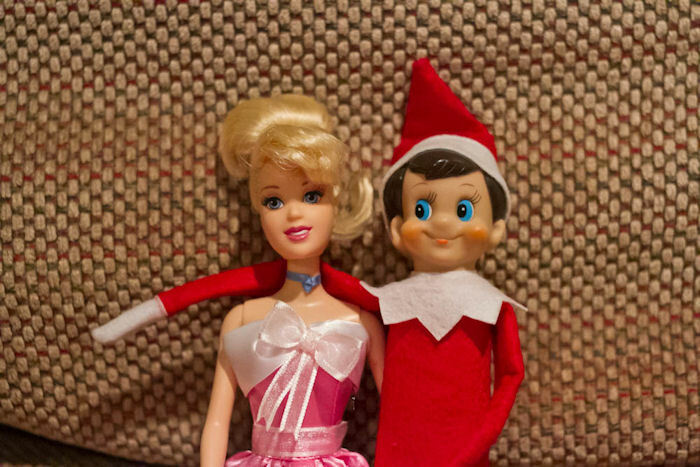 December 13 – Some days I get too busy and forget about Buddy til the last minute…so this day was a quick idea – we found him watching a movie with Cinderella. 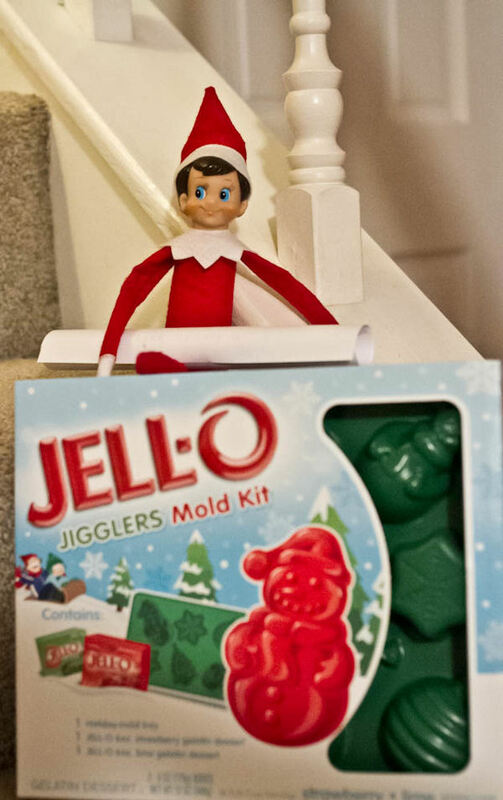 December 14 – Unfortunately a nasty tummy bug hit our house, so I picked up some Jello Jigglers and left a get well note from Buddy for the kids. They really enjoyed this one. December 15 – I always try to keep an eye out for cheap toys and props that I can use with Buddy. 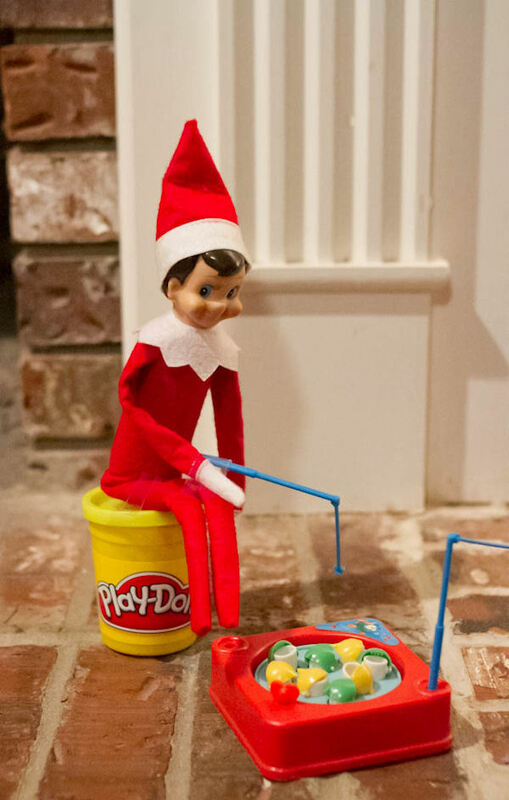 I’d seen a few ideas similar to this on Pinterest so I found a cheap fishing game and had him playing with it that morning. 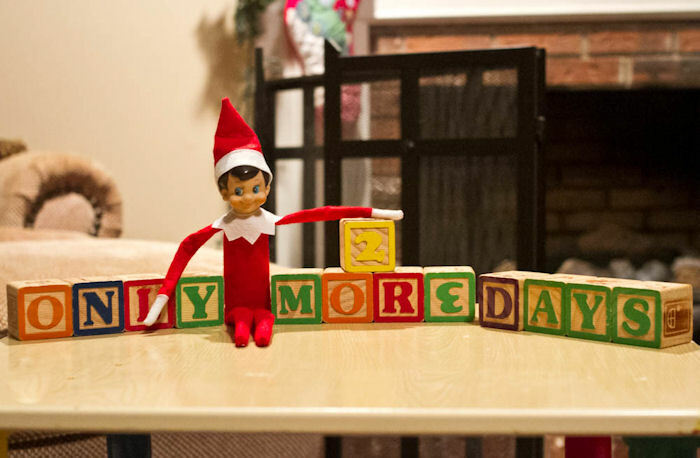 December 16 – My kids seem to always enjoy the mornings when they find Buddy playing with their toys. They are convinced he uses magic to bring them all to life so it’s fascinating for them. 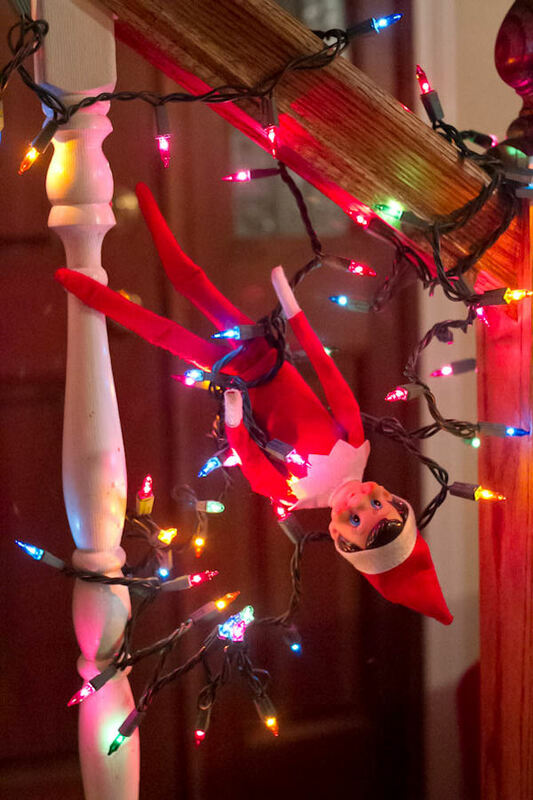 December 18 – Another morning when Buddy got in a mess trying to decorate. December 19 – I had so much fun with this one and the kids LOVED it. The little sign that the birds are holding says “Tell us where you hid our eggs!” My son Avery got such a kick out of this one. 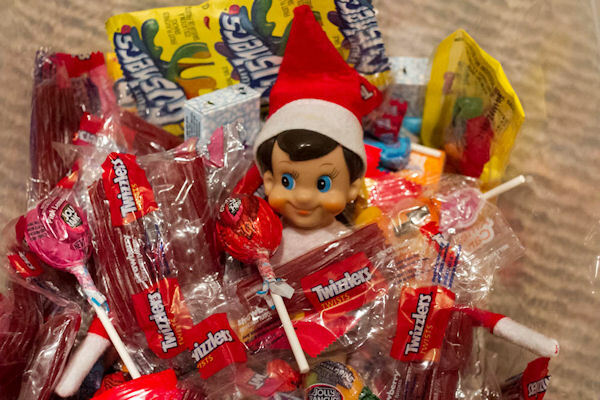 December 20 – I had a bunch of leftover Halloween Candy, so the kids found Buddy buried in it. 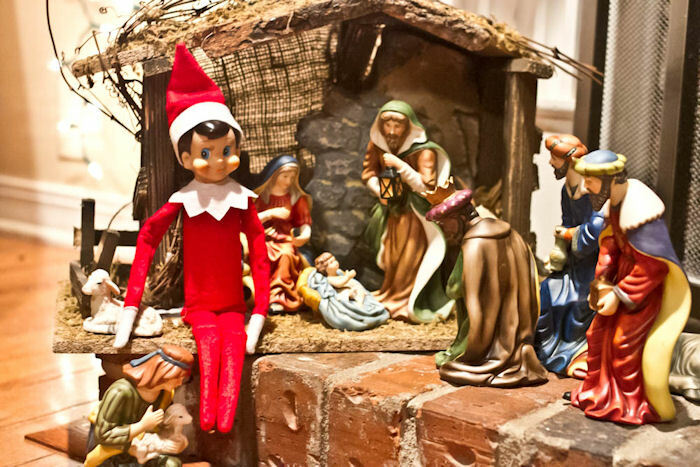 December 21 – A reminder of what Christmas is really all about. I sat with my kids on that morning and we talked about the Christmas story. The kids know that Buddy leaves with Santa in his sleigh on Christmas Eve. I wrote a note from Buddy the first year he was here but the kids were so excited about opening presents that it got lost in the shuffle, so this year I didn’t bother with it. 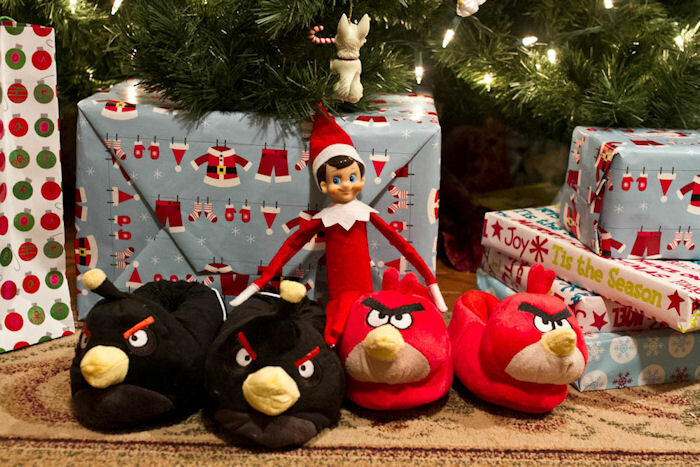 The best thing about Elf on the Shelf is that you can be as elaborate or as simple as you want with it. I know some people simply leave Buddy in different spots for the kids to find every day, and then I’ve seen some examples on the internet that are super elaborate. I just like to have fun with it. 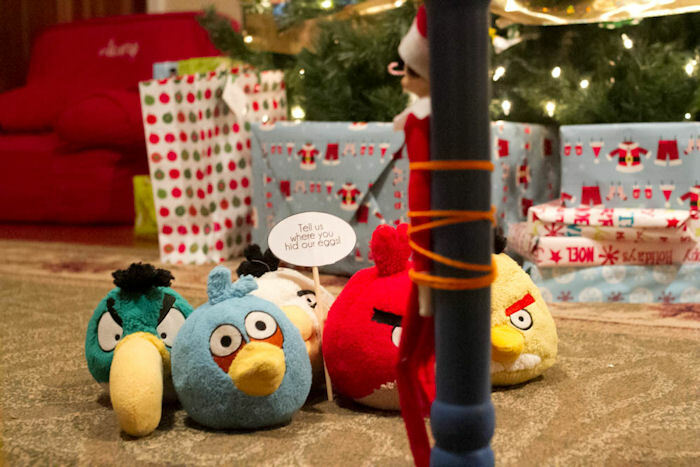 My kids won’t be small for long and I like to create as much innocent fun for them as I can at Christmas Time. 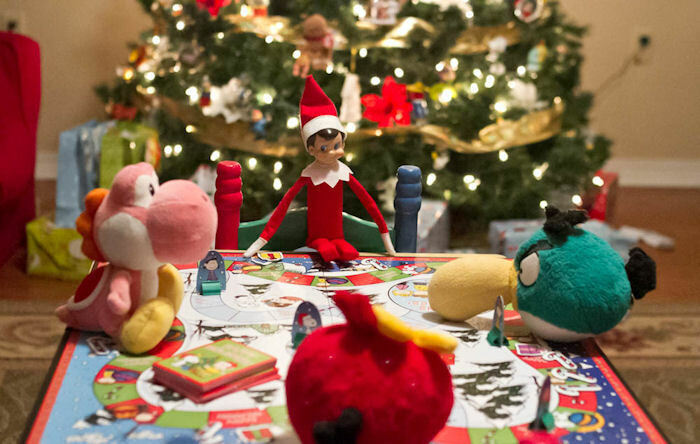 I hope our little Elf Adventures have inspired some of you! Thanks for all the cute ideas. I love doing this for my son and you have some ideas here that I haven’t seen before! thanks – i may copy 95% of these this year just to make my life easier 🙂 heehee 🙂 i’m so excited for christmas! 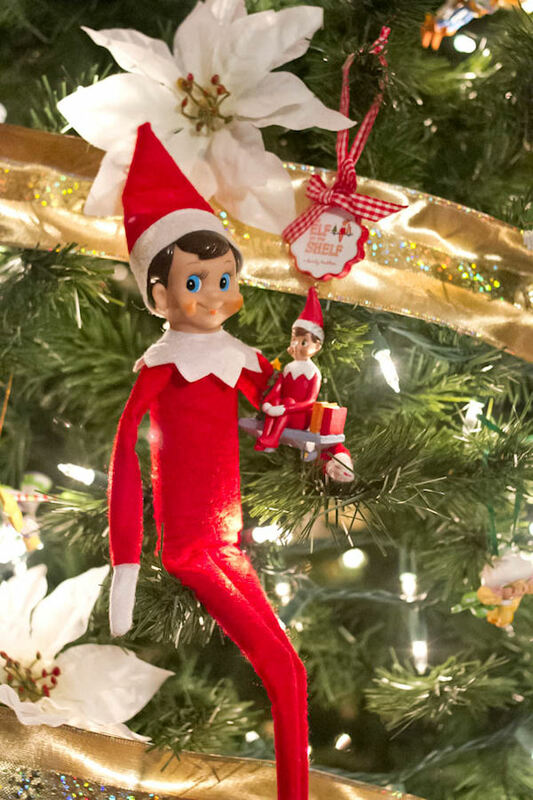 I always keep Elliot, our elf, around for a couple of days after Christmas. I forgot to pack him away one year & told my kids that he reports back to Santa if they like their presents. 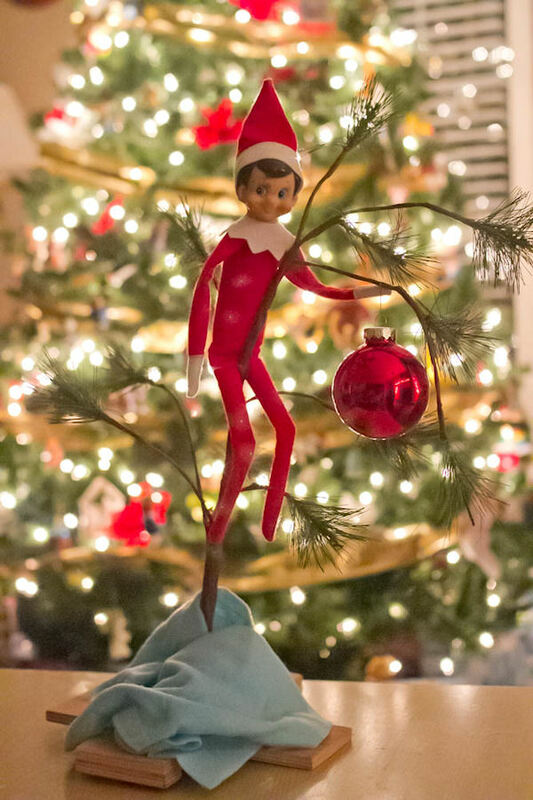 Our Elf came for the first time last year (his name is Tinsel Larry) and my older boys (ages 9 and 10) at the time still LOVED it. I think their favorite antic was Tinsel Larry writing out “I will not feed Rudolph marshmallows” about 100 times using their lap desk on the couch. They also enjoyed him being stuck outside the window like he flewinto it trying to get inside (I used clear packing tape). He also used our gravy boat to take a bath in marshmallows, complete with a washcloth towel, bathmat, etc. 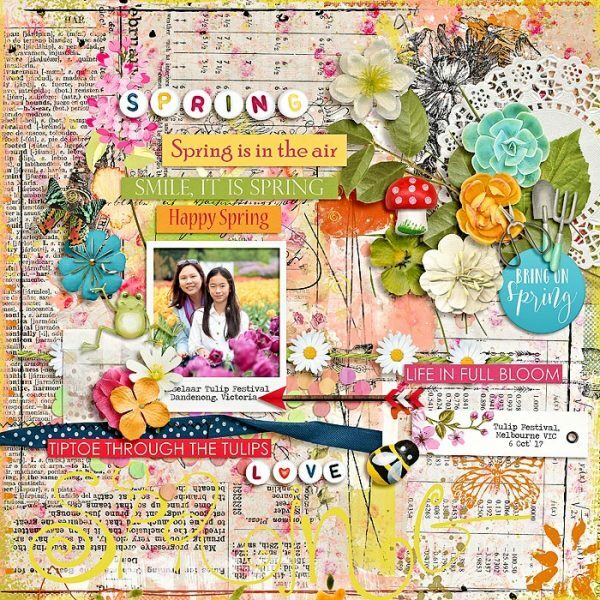 Just wanted to share a few ideas as I got sone great ones from you! I’m already planning his antics this year! My youngest has already asked me if Tinsel Larry is coming back this year. To get around the problem of moving our elf after we find him and his adventures each day I asked Santa to deliver a special pair of gloves…. bright stretch gloves ONLY for elf touching. This way the kids stopped freaking out that he would lose his magic if I touched him to clean up his messes each day. We keep our bright yellow glove nearby just in case.